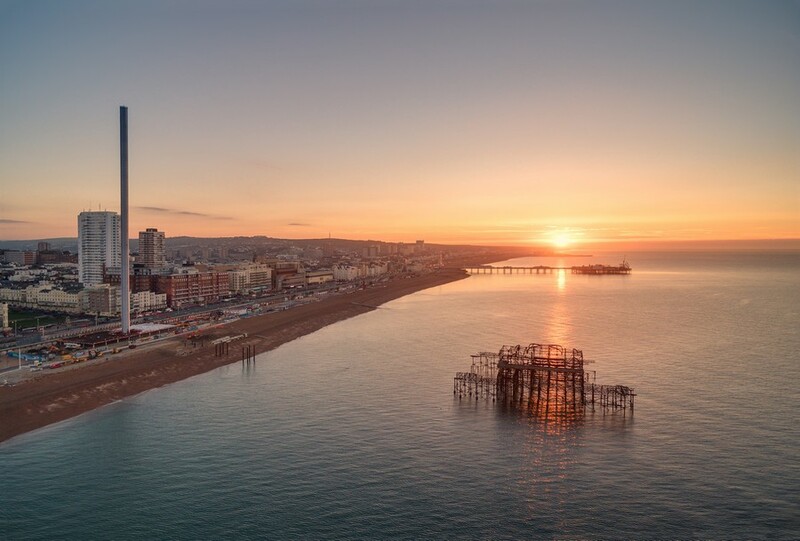 Barges will arrive at Brighton Beach from Holland from first light on 11 June, delivering the steel cans which will form the tallest new UK visitor attraction outside London, conceived and designed by Marks Barfield Architects, creators of the internationally acclaimed London Eye. 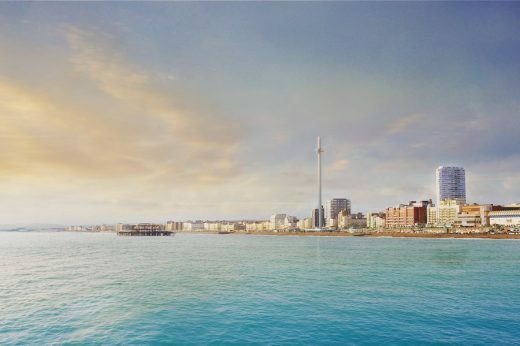 Brighton i360, which will be the world’s first vertical cable car and the tallest observation tower outside the UK is being constructed by an international team, bringing together specialist design and engineering from the Netherlands, France, Germany, Italy, Spain, Australia and the UK. 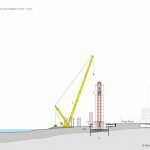 A 100-metre high crane will unload the 17 specially fitted out steel cans, each measuring between six and 12 metres, directly onto the beach and using a giant jacking tower, they will be joined together to build the 162 metre high tower. 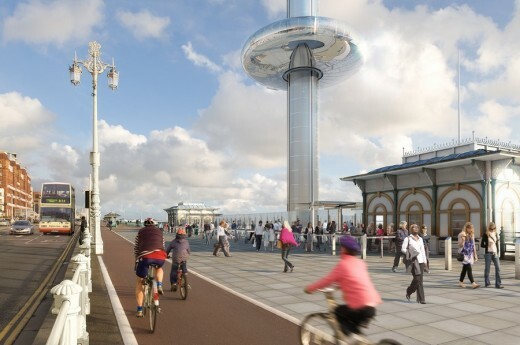 When the i360 opens in summer 2016, visitors will glide up to 450 feet for breathtaking views of the south coast from Chichester to Bexhill-on-Sea, the South Downs National Park and Brighton. Seven thousand tonnes of gravel, shingle and chalk have been moved to create a platform for the delivery, whilst a 4,000 tonne concrete foundation has been built under the ground to balance out the towering feat of engineering. The first half of the concrete was poured on 30 May and the second concrete pour will take place on 10 June. The tower will be completed this summer and then open in summer 2016, when the pod has been built and added to the tower and the visitor centre at its base is completed, to incorporate a 400 seat restaurant; a shop; children’s play zone; exhibition space; tea rooms; and conference and event facilities. 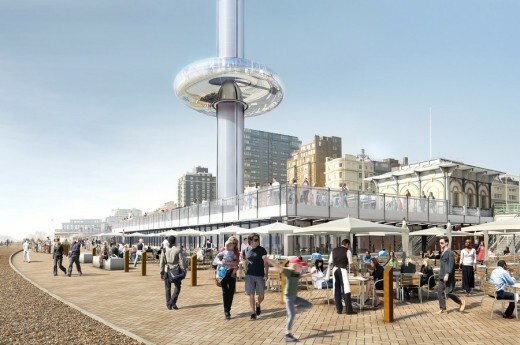 29 July 2014 – The next phase of regeneration for Brighton’s western seafront around the future i360 has been formally unveiled today. 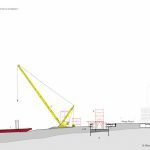 This included a new creative retail quarter on Brighton beach and ground was broken for the construction of the Brighton i360 attraction. Members of the community, local businesses and the i360 team gathered to see Brighton & Hove Mayor, Cllr Brian Fitch, cut a ribbon to open the arches, which have undergone a painstaking restoration, between Alfresco and the future i360 site, with eight independent small creative firms opening for business. 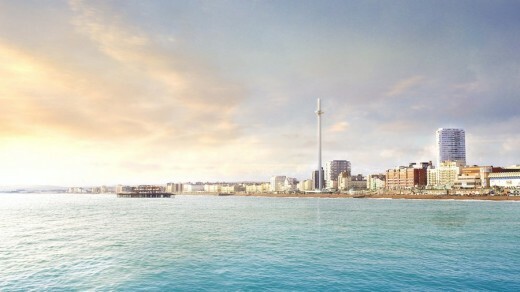 Brighton & Hove Council leader, Councillor Jason Kitcat led a group including David Marks, the architect behind the i360 and the London Eye, putting the first ceremonial spade in the ground to formally start building works for the Brighton i360, the world’s first vertical cable car observation tower, expected to attract millions of additional visitors to Brighton. Said Cllr Ian Davey, deputy leader of the city council, “The restoration of the arches has been carried out as part of ongoing work to strengthen the A259 seafront road by the council’s transport team, with external funding from the Local Transport Plan. Said Rachel Clark, West Pier Trust, “This is a very special occasion for the West Pier Trust because it marks the beginning of a long awaited new era. 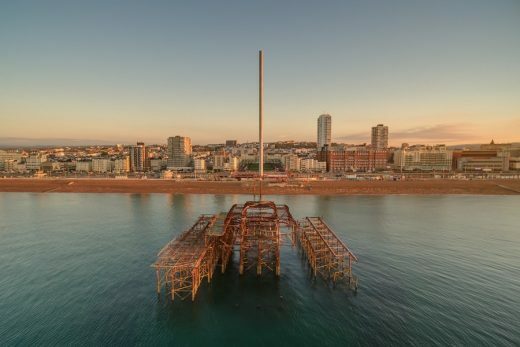 The i360 will be a brilliant attraction and entirely in the spirit of the West Pier – a vertical pier. It will transform the site and the entire city.. We would like to thank our members for all their support for the i360 and getting us to this point. We are delighted that two of our traders from the West Pier market, (Magi Altwegg and Dorian and Dinah Delap) have moved into the new arches. The city council began a £5 million project to rebuild, strengthen and refurbish the Victorian arches in November 2012, between Alfresco and the West Pier. The work was needed due to Victorian structural deterioration, causing cracking and subsidence of structural elements; and allowing rain to leak into the arches below. The seafront arches work is part of the council’s long-term seafront strategy designed to encourage business and enhance the city and will complement other work taking place in the area, the centre piece of which is the i360. Premises to the west of the former West Pier have now been rebuilt using a reinforced concrete frame and roof, together with ornate brick facades. The brick arches themselves have been fabricated off site and brought in. All the bricks have been specially made by Ibstock following the careful mapping and surveying of the old façade. Many new bricks are special non-standard shapes and sizes. New wooden frames, doors and windows have been made by Seth Evans Joinery near Worthing. Iron railings above have been re-cast from moulds dating back to the 1880s. Council Project Manager Leon Bellis has worked closely with the design engineers, Amey, architects Solar Architecture and the contractor C J Thorne. Council conservation and planning experts, together with English Heritage, have been closely involved to ensure authenticity. The first phase of the works is now complete, delivering 26 new arches which provide 10 double-arched business units or artists’ studios; plus a newly refurbished seafront toilet block at the eastern end, which opened last month (on 27 June). The West Pier arches will house a range of retail outlets selling designer gifts and home ware, children’s clothing, photographic prints, frames and books, and a hairdresser and beauty salon. At 162 metres high, and with an observation pod rising to 138 metres, the i360 will be the world’s first vertical cable car and the tallest observation tower outside London, offering a new perspective on the fun loving seaside city of Brighton. Sited at the root end of the historic West Pier on Brighton’s seafront, the i360 has a slender, elegant design, with a futuristic pod allowing 200 visitors at a time to enjoy the surrounding view as it slowly unfolds. 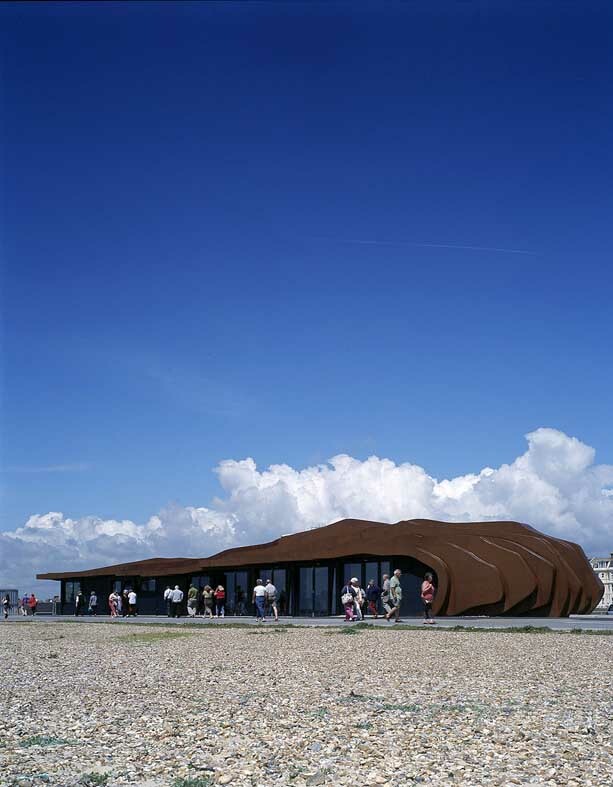 The visitor centre incorporates a 400 seat restaurant, a shop, exhibition space and conference and event facilities. Founded in 1989 by Julia Barfield and David Marks, Marks Barfield Architects (MBA) conceived and designed the London Eye in 1993 and also has a diverse portfolio of projects that includes schools, cultural, transport and sports buildings as well as the Kew treetop walkway and Pier outside Tate Britain. Marks Barfield has won more than 60 awards for design, innovation and sustainability. The team comprising of engineers and contractors Hollandia from Holland, Poma from France, Jacobs Engineering Group Inc (Jacobs), Marks Barfield architects from London and locally-based civil contractor JT Mackley and structural engineers Hemsley Orrell Partnership (HOP) had a planning meeting at the Hilton Brighton Metropole, gearing up to start construction next week. 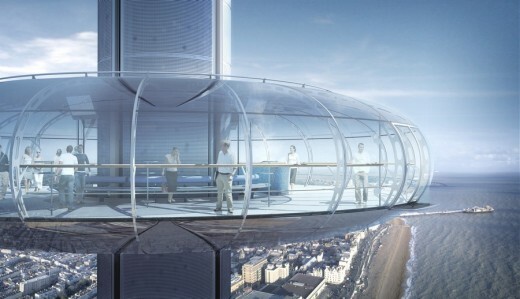 The i360 passenger pod is 18 metres in diameter and has a capacity of up to 200 people at a time. 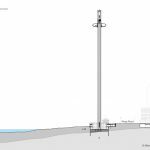 The viewing pod will provide a 360 degree view through curved glass and will travel smoothly up from street level up to 138 metres above sea level before returning to beach level. 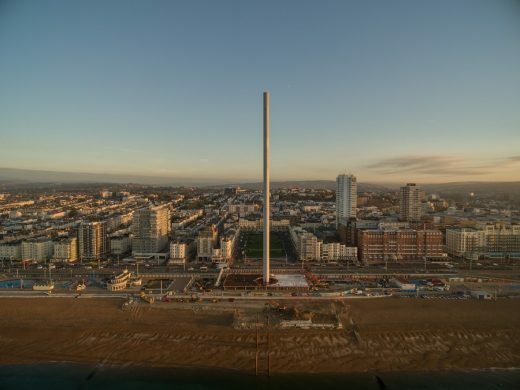 With an aspect ratio of 40:1 (height to girth), the tower is a feat of cutting edge engineering combined with innovative technology and elegant design to create the futuristic visitor attraction on the Brighton seafront. Main contractor Hollandia, who built the London Eye structure, will be responsible for the construction and erection of the steel tower in sections named ‘cans’. 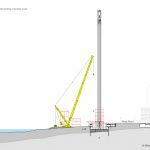 The tower will be constructed by jacking up each steel ‘can’, placing the next underneath until the full height of the tower is reached. This method of erection is less weather dependent than using tall cranes. 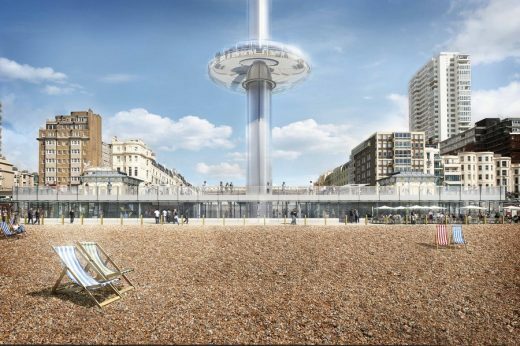 The steel ‘cans’ for the tower will be transported by sea and arrive on Brighton Beach in spring to early summer 2015. Poma, who built the 32 London Eye capsules, is a French company which manufactures cable-driven lift systems, including funiculars, aerial tramways, people movers, and surface lifts. 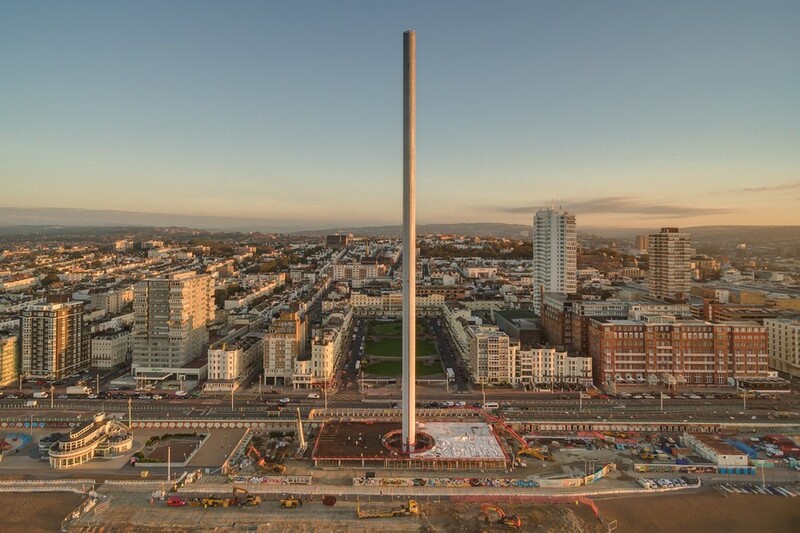 They are responsible for the construction of the i360 pod, which will be large enough to contain 200 visitors with a birds eye view standing side by side. 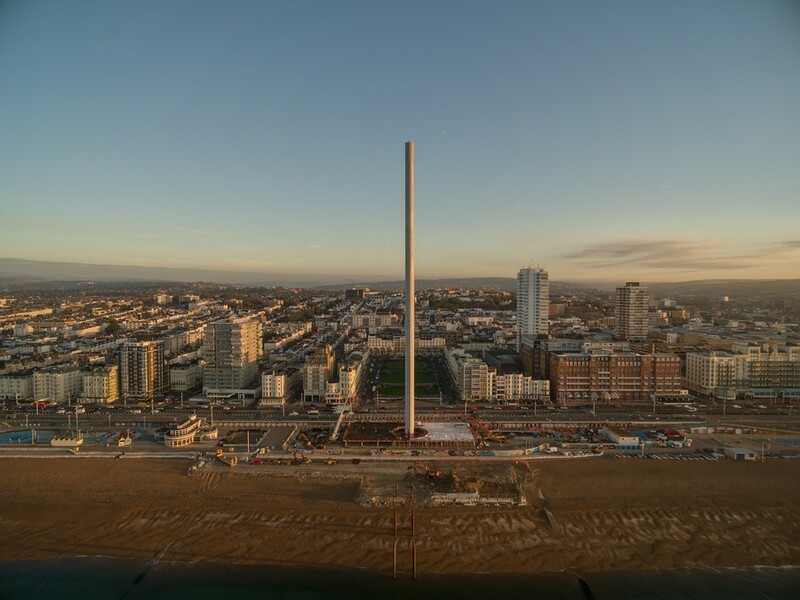 JT Mackley, who will be carrying out the ground-works and building the i360 conference centre, were founded in 1926 and are based just outside of Brighton and bring with them a wealth of local experience of coastal and seafront construction.